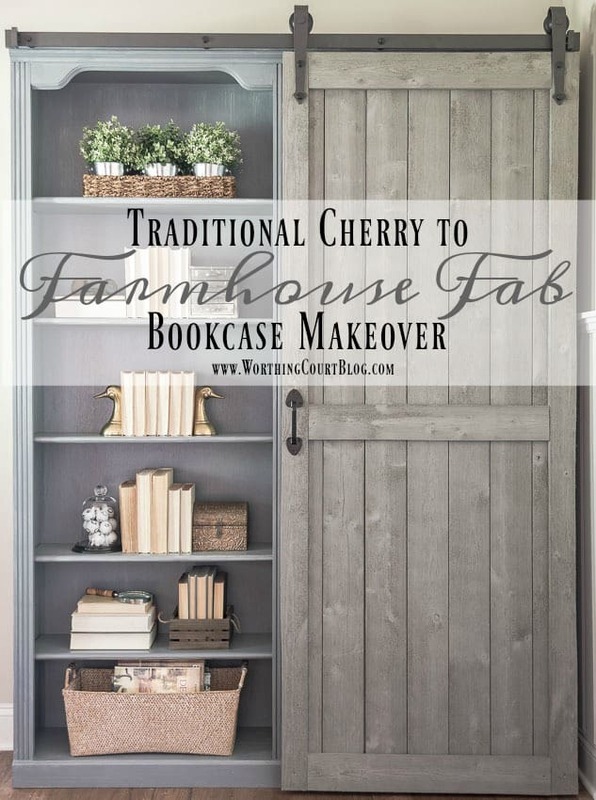 Bookcase Makeover – Traditional Cherry To Farmhouse Fab! UPDATE: Click HERE to see the finished room reveal with before and afters! I usually don’t put an exclamation mark in my blog post title, but y’all – I am so stinkin’ thrilled with the bookcase makeover for our home office! A few weeks ago, I mentioned that I was working on the bookcases and was concerned with how they were going to turn out. Thankfully, I’m in love with the end result and find myself stopping often just to stare at them! Did you notice that the dining room is striped bare of all its fall finery? That’s because Christmas is in the house! LOL I’ll be sharing my Christmas dining room soon! To fully appreciate the change in the bookcases, take a look at the before. These are cheap-o bookcases that had a waxy, fake looking cherry stain on them. Their most redeeming quality is that the shelves are solid wood, so they don’t sag under the weight of a lot of books. Here they are today, after giving them a couple of coats of primer paint (to completely cover the red’ish stain) and brushing on gray stain. I used one of those cheap chip brushes to apply the stain and allowed it to dry without wiping any of the stain off. Primer paint used: Kilz 2 Latex Primer in Gray. Stain used: Rustoleum Ultimate Wood Stain in Weathered Gray. 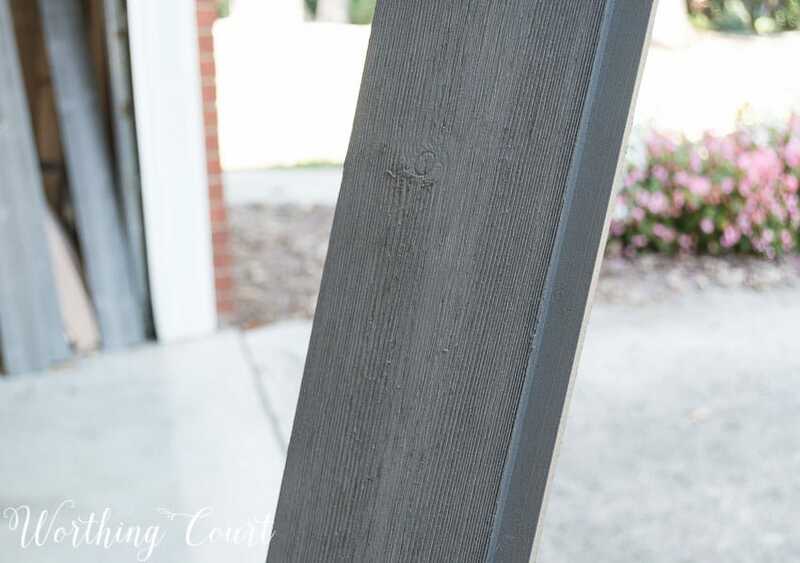 This closeup shows the weathered looking finish that was created by brushing the stain on top of the wood and allowing it to dry without wiping it off. I know that the gray of the door and gray of the bookcases doesn’t match, but I think that it makes the door look more authentic. You might wonder why I chose to cover half of the bookcases with a sliding barn door. Well, it’s because I needed more storage space, not more space to display tchotchkes. The shelves behind the sliding door are filled with boxes that hold all sorts of home office paraphernalia. This side of the bookcases is only open when we need access to something in one of those boxes. I was a little scared of the door, because I was convinced that installing the sliding door hardware was going to be complicated. Nothing could have been further from the truth! After much research and shopping around, we ordered the hardware from Home Depot. CLICK HERE TO ORDER THE SAME HARDWARE (affiliate link – see my full disclosure HERE). The smallest size available was a few inches longer than what we needed, so Pookie simply used our Dremel to cut the slider bar down to the correct length. I touched the end up with a black magic marker and now you’d never know that it had been cut. Pookie built the barn door out of pre-painted rustic lumber sold at Home Depot. Click HERE to see the exact lumber that we used. Each piece of lumber was 8′ long and had a rabbited edge on each side. One rabbited edge faces the front and other faces in the back. Having those rabbited edges made building the door a dream! First, we determined how wide we wanted our door to be. Then Pookie laid the lumber out on the floor of our garage, using wood glue along each rabbited edge, and allowed it to thoroughly dry. No nails were used in this part of building the door. After the glue had dried, the door was cut to the length that we wanted and other boards were cut down to be used to frame out the top, sides and for a middle brace. Those boards were attached with wood glue and wood screws. Thankfully, Home Depot had a label on the backside of each of the pieces of lumber with the paint formula that was used to paint the wood. I had a small container of that mixed at the store and used it to touch up the few places that needed it after the construction was completed. A wrought iron gate handle, also from Home Depot, finished the door off. Unless I come up with something else, this office makeover only has one project left to do and that’s getting some artwork up on that wall behind the desk chair! You can catch up on all of the projects that have gone into this makeover, from start to finish, HERE. UPDATE! CHECK OUT THE FULL BEFORE AND AFTER OFFICE REVEAL HERE! NEED BOOKCASE MAKEOVER INSPIRATION? SAVE IT FOR LATER. That is totally amazing! What a great idea and your husband’s craftsmanship is beautiful! Thanks for sharing! Wow, what a great idea!! I have 2 bookcases that I was going to get rid of . Thanks for the great details and inspiration! Charming! What a clever makeover. Your husband did a wonderful job. I love the whole room. Well done! Wow! Love the barn door! What I wouldn’t do for a handyman that could build something like this for me! I really like this! I’m redoing my house – on a much smaller scale – but I always get a lot of good ideas. Thank you so much for all the inspiration! OMG genius! This would be perfect for our office, sewing, art room! Thank you for a great idea and complete detailed instructions. Your office looks amazing. Love the gray stain. That looks great! I love the weathered look. What a transformation!! You have great ideas – not to mention the energy to complete your tasks!! Good job! Oh my gosh, Suzy. I love, love, LOVE it. I would never have guessed that fabulous bookcase started out looking the way it did. It’s perfect ! Beautiful job! I love love love this look!! Amazing!!! Absolutely love it! What a transformation! LOVE LOVE LOVE this! 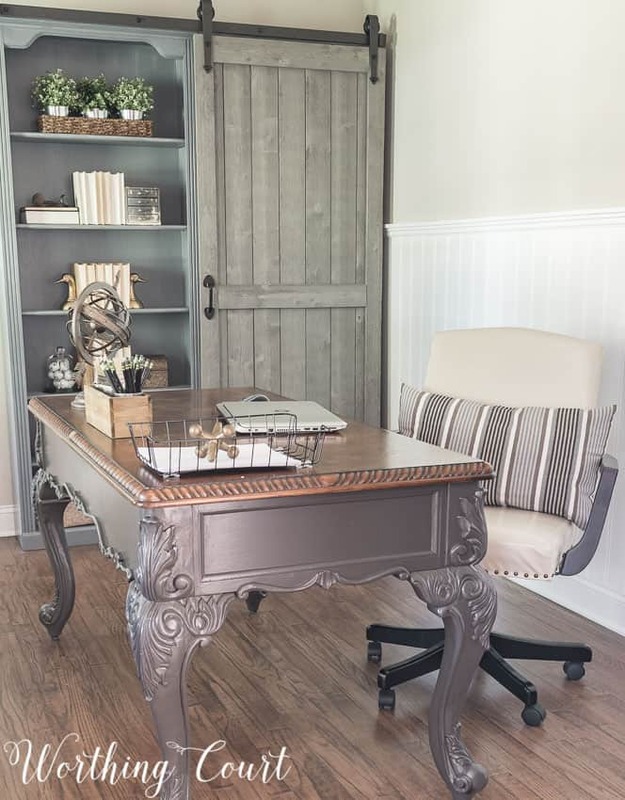 Your office has to be a favorite spot in your home. The colors you have chosen for everything are at the top of my list. 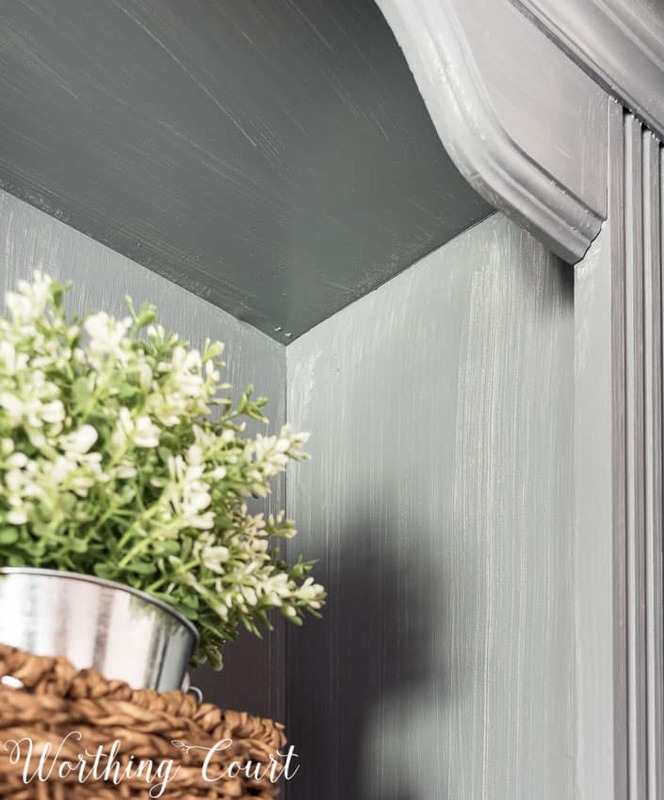 Just wondering…..do you think finishing the wood with the stain the way you did will help the finish be more durable and resist chipping, even though there is a paint primer under it? I might want to try this technique and wondered if this would be a fun perk. Hi Patty. To be honest, I’m not sure. It feels durable to the touch and hasn’t chipped or scratched, so far. I’m not sure how it would hold up under heavy use. To be sure, I guess you could apply a coat of polyurethane if you wanted to protect it. Beautifully done. Love the sliding door idea. Kudos to you and hubby. I LOVE the barn door on the bookshelves! I’ve been hunting for a place to add a sliding barn door in my home, but all my doorways are arched and I haven’t wanted to loose the arch. I think this could be my opportunity to finally be able to add one. Thank you so much for all your clever ideas. This room is wonderful and has such a perfect flow with the rest of your home – something I am trying to achieve in my own home. I absolutely love the bookcases – fantastic idea!!! Wow! from me too! I love this idea! 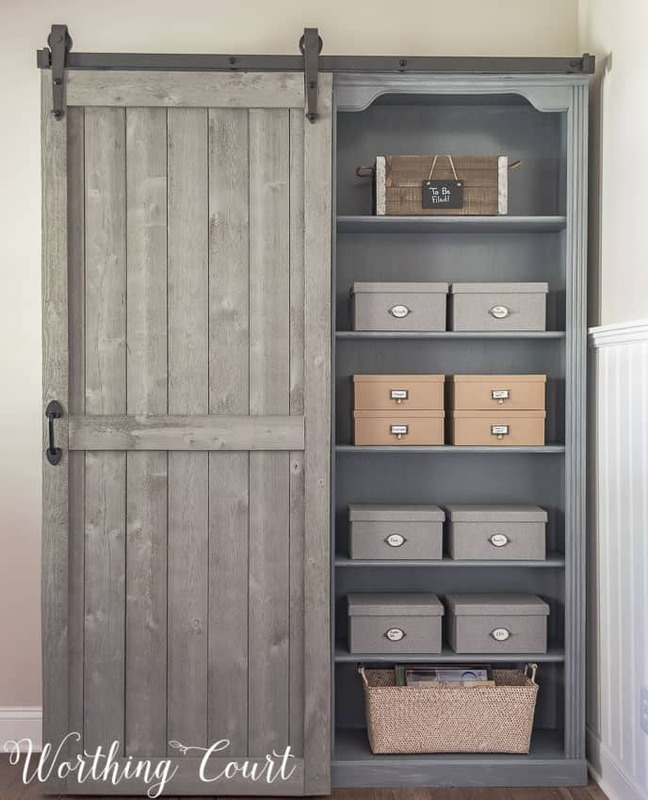 The creative use of the barn door is perfect for hiding your storage. stunning-cheers to your Pookie! Home Depot here I (we) come! Beautiful! What a project to take on and with great results. 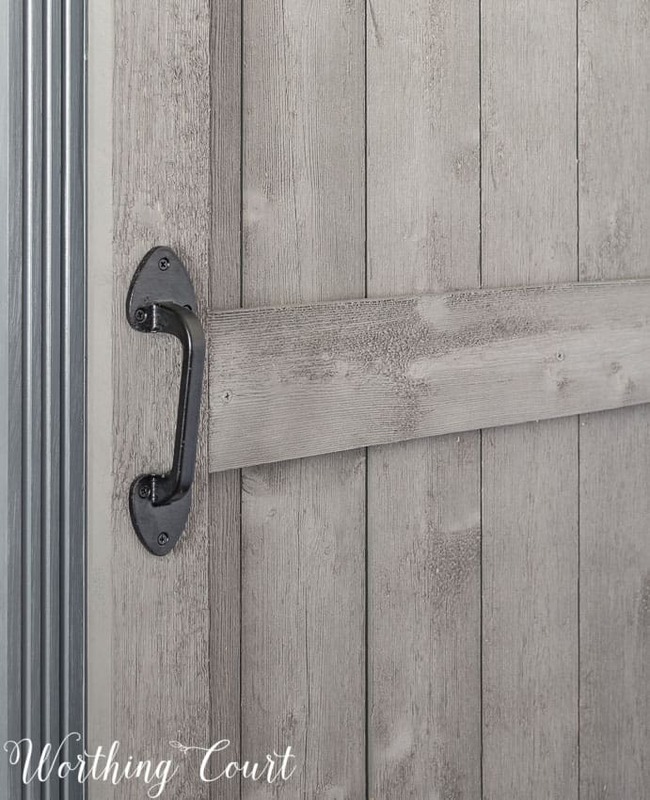 Barn doors are so popular and it is a challenge to know where to use them. Thank you for sharing. Such a neat idea and it turned out amazing! Suzy, it’s amazing! I adore barn doors, and this is such a unique way to incorporate one. Absolutely love this!!! I have an entertainment center bookcase that was my mom’s and this would be awesome to do!!! May have my hubby make a barn door for my pantry as well!!! WOW – great job, Suzy!! I love it and you’d never know that is the same bookcase! The room looks so good…I’m looking forward to the final touches. This is amazing!!! I love it!!! Great job!!! This is one of the best DIY projects I have ever seen! Your office space looks like Joanna Gaines herself did it! I really love this idea. You have inspired me to try this! Thank you! We have a hand-me-down set of cheap bookcase that are in desperate need of a makeover. I love how your’s turned out. Thanks for the inspiration! Love how it turned out. I love the barn door. What a transformation from outdated to farmhouse . I Love your bookshelf, it is absolutely gorgeous. The colors perfect, and the sliding door I Love. You probably have the only bookshelf with a sliding barn door. Fantastic job! Oh WOW! 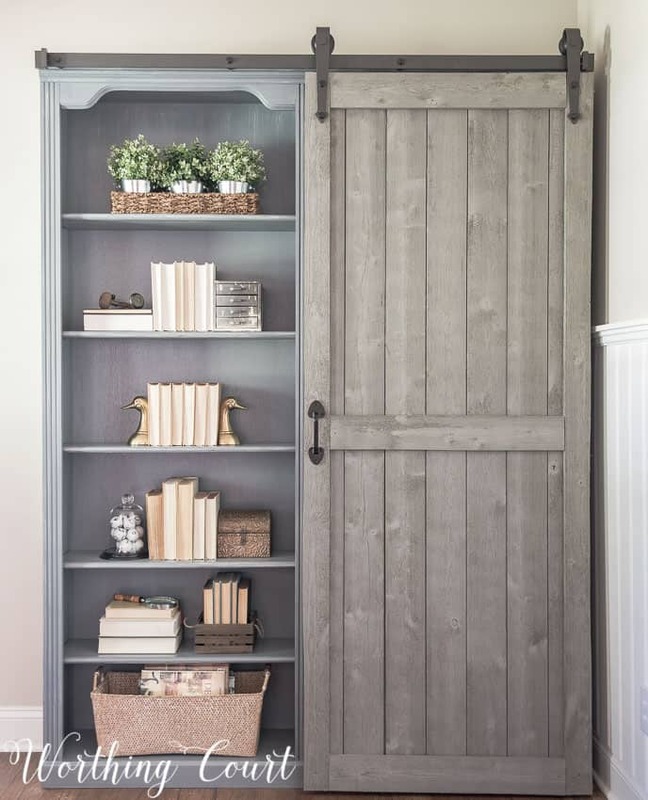 Your bookshelves look so nice with that sliding barn door and the gray finish. That is so beautiful and looks perfect in your office. 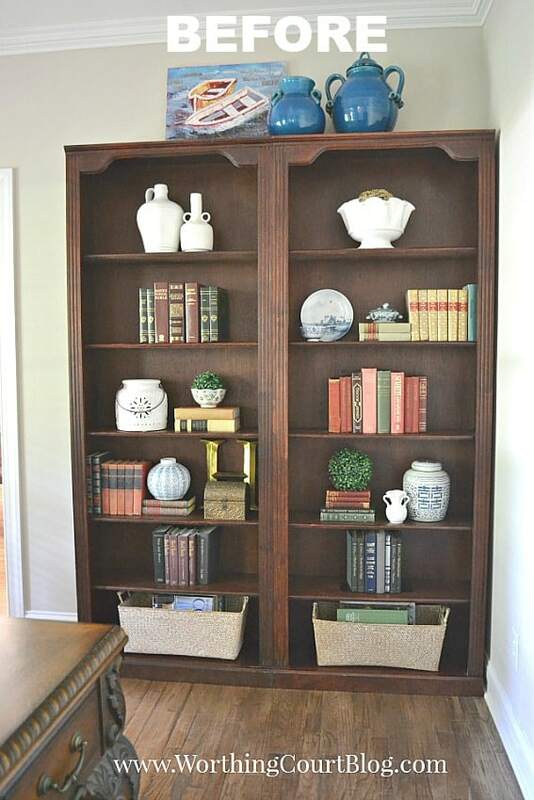 Brilliant idea for redoing ordinary bookcases and making them unique, beautiful and add storage at the same time. Thanks for all the wonderful ideas you pass on to us. Oh girl, this turned out fabulous!!! ??? Reminds me of the expensive one we drooled over at Arhaus. I was excited when I saw this wood at Home Depot when we were researching building the barn door headboard for the Destin condo. It is fantastic and the perfect weathered look! Thank goodness we finally found someone on Etsy to build ours because as you know I don’t have a talented Pookie LOL. Great job, both of you! You’re so clever! Oh, curious….did you attach the headboards with a strip of wood at the top, then attach the hardware to it??? Also sent you a text yesterday regarding a local upholsterer. Hey GF. Yes, we added a strip of wood to the top of the bookcases to attach the rail to. It spans the length of both bookcases, ties them together and gives them more stability. So glad you like them! I didn’t get a text from you???? Truly amazing. You are so creative! I knew you redid the dining table, but somehow I missed the desk redo. The whole room is truly transformed. I liked the before, but the after is so much warmer and more welcoming. Really great job, Suzy. Just fabulous Suzy! What a transformation! May I ask how the track maintains it’s stability? Is it screwed down into the top of the bookcase? Hi Laurie. We added a strip of wood to the top of the bookcases (with screws) and painted/stained it to match. The wood is long enough to span the length of both bookcases, which ties them together and adds stability. The track is attached to the wood that we added. They look great. What a transformation! Love the new look. he does a great job as well. This is brilliant…but your “bad” side looks so good too…way better than the shelves in my office. Great job! Gorgeous makeover, really fabulous! Thanks for sharing on craft schooling Sunday! Wow! This is absolutely beautiful! I can’t figure out where to do this in my house but I think I need to find a way. The bookcase is really beautiful, what a transformation. The entire office makeover is a stunner! Love the changes to the bookcase. I have a similar set and you have motivated me to be brave and try the same! Thanks! OMGoodess this is amazing! I don’t even know how you thought of it. So creative! Absolutely love this. I have 3 bookshelves I purchased some years ago from Target for $99 each that my daughter keeps telling me to get rid of because they are outdated. Now I know how to update them! Perfect. Also, what is the type of wood and finish on your floors? It is such a perfect color I love it. Hi Andrea. Our floors are white oak hardwood stained with Minwax Special Walnut. Have fun with your bookcases! Your farmhouse bookcase is just beyond beautiful Suzy!! I love it so much!! Love, love, love this! I wish I had seen this before I bought my bookcases! I am more than impressed! Everything looks SO nice and coordinated!! Love it! how cute is this! I love the unique barn door idea – it came out so cool! coming year as I have a built-in bookcase where this would be a great improvement. Adding the barn door is genius! Super gorgeous! Couldn’t be any classier. This is just brilliant! I have so many dark, ugly bookshelves. I love the idea of having some private storage! I am so stealing this idea! 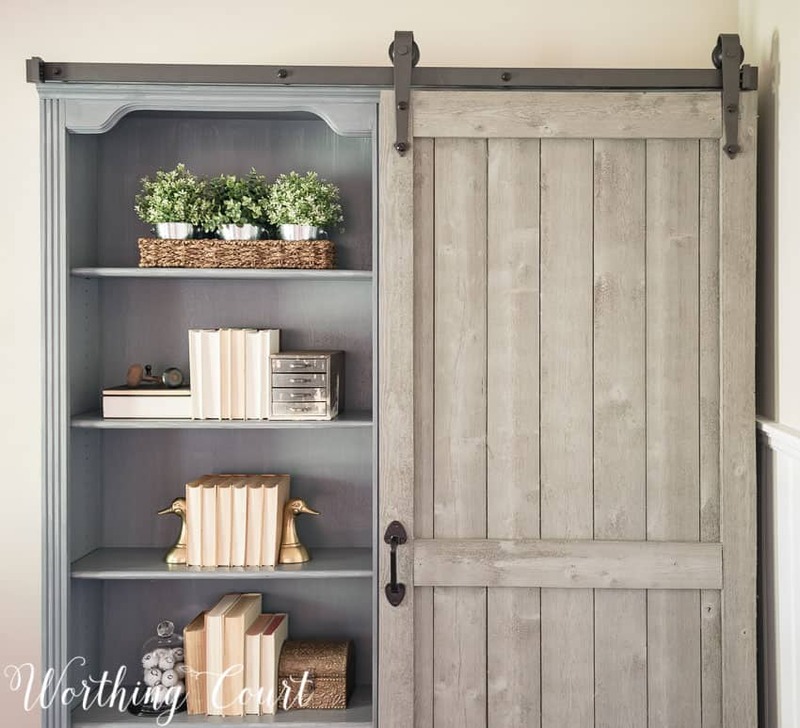 The book case is gorgeous, what a great idea to add a barn door. I wondered how you added the slide bar to the top because it was narrow but I see that is answered in another’s comment. 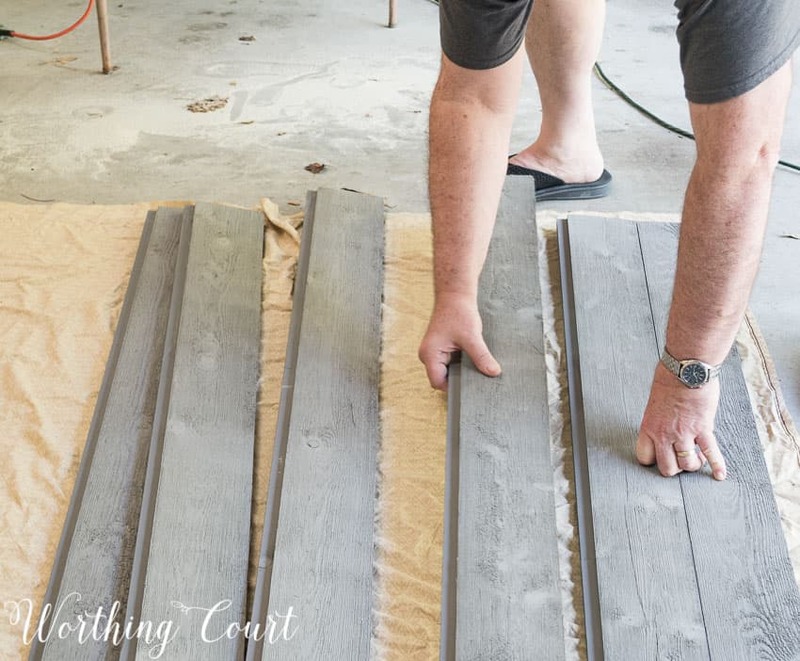 Thanks for sharing this tutorial, you did a fabulous job with the stain and the barn door, it is truly an inspiration! You have inspired me!! I have some tired looking cherry bookcases that desperately need some updating!! I am so trying the prime/stain technique on them. Thank you for sharing all of your ideas with us–your blog is one of my very favorites! This bookcase makeover just keeps drawing me back, again and again. I will steal this idea for sure! LOVE it! Love the Bookcase door and color. Maybe I can talk my husband into a makeover for my Bookcase. Love The door and the color. Brilliant. I have a simple set of bookcases that could do with an update and now I know exactly what I am going to do! What a great idea, to add a barn door to bookshelves! Thanks for the tutorial! that is Awesome!!! Gonna have to get the Hubby to do it to our bookcases!!! Fabulous makeover. Giving me some ideas…. thank you! I LOVE your bookshelf makeover! How original and creative!! You did an amazingly job and I love the color! That is a wonderful change. I love when you can do something so cool and it does not cost that much money but has such a big impact. Just wondering, since these are bookcases, does the rail for the barn door attach to the top of the book cases? I love the idea! You did a great job. Thanks for the information. Hi Becky. I would have liked to attach the rail to the bookcases, but there is a small crown moulding at the top of them that was in the way. So, my husband added a piece of wood to the top and to the sides and that is what the rail is attached to. I then painted/stained the pieces of wood so that they would match the bookcases. We downsized and now I have no office.. What I do have in the family room is an 8 foot inset on one wall. This will be my new mini office. I need 2 bookcases and a desk. Have been searching and searching for a desk that I can close.. I really like what you did with the book cases.. My wheels are churning now. May see about doing this but having my DH build them but make them deeper so I can incorporate a desk in the center with the bookcases flanking the desk. Hmmmm Thx! Best bookcase makeover I’ve seen! I love this, it is so beautiful and just want I am looking for. Wish my hubby we as talented as yours! 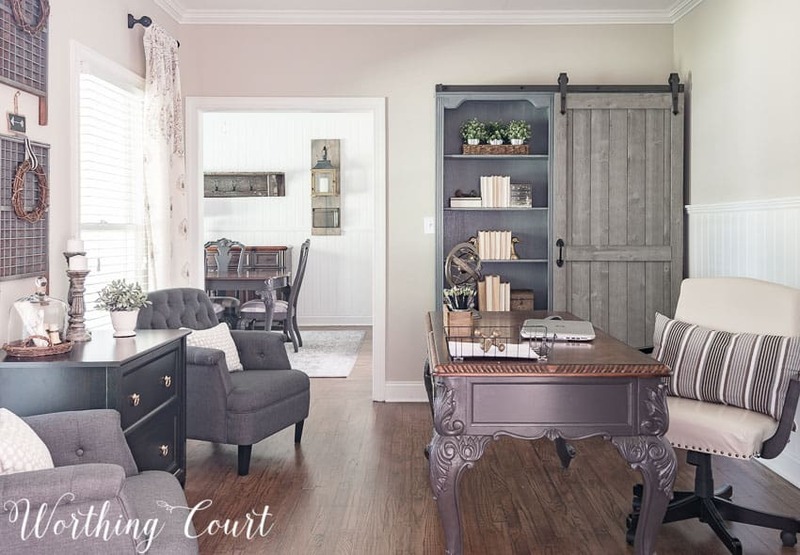 I absolutely LOVE the barn door bookcase! Can you share what grey exactly is on the actual door? I would love to try to make something similar! Hi Larkin. If you’ll send an email to worthingcourblog@gmail.com, I’ll send you a photo of the paint label that has the formula on it. Hello, I also love the grey on the barn door! Would you mind sending me a picture of the paint label as well? Hi Lisa. Please send me a request to my email: worthingcourtblog@gmail.com and I’ll send it to you. I can’t post a picture in the comments. Absolutely one of the very best ideas on the internet! LOVE THAT Barn Door look on the shelving!! Stunning. This is the most incredible makeover I believe I have ever seen! The before and after would be unrecognizable is I had not seen the photos. You have inspired me and many others. Beautiful! Love the bookcase makeover! I actually have a cherry bookcase in my den that looks very similar to yours. It matches my desk so I’d have to do that over too. This is really pretty! I love the three plants on display on the top shelf. May I ask…where did you find them? Hi Suzy – I’m loving your office chair!! It looks like you have somehow upholstered a modern chair and made it look old. May I ask how you did that? Hi Joanne. Actually, I haven’t done anything to the chair. It’s a very inexpensive chair that I ordered a couple of years ago – from Amazon, I think. It’s covered with an off white faux leather. Maybe it’s the nailheads that make it look old??? I just found your blog and have to say what a beautiful room. Everything turned out amazing. I especially love you remodeled bookcase. What a great idea. It’s my favorite. I signed up to receive future newsletters and look forward to your decorative ideas and special touches. I’ve recently started transforming my house to French County. But being retired it’s a slow process. Being on a set income. Thanks so much for sharing. Did you cover books in something to give them all the same feel or did you just turn them around? This is one of the most fabulous ideas I have ever seen for those old dreary looking cherry bookcases I have! I just spotted this on Pinterest-looks amazing! I have a couple of questions: does the weight of the barn door require you to secure the unit to the wall in fear of it tipping forward? Also, do you put the bottom of the door on a track or is that free-floating? Thanks! Hi Susan. Yes, we added small angle irons that are attached to the top of the bookcases and to the wall to keep them secure. And no – with this type of door hardware, the door is just free floating. Hope this helps and I’m sorry for the delay in responding! This is so beautiful!!! Thank you for sharing how you did it. I’m not sure I’m brave enough to try it but I’ll give it some serious though bc I’m in love!!! Great job! !